Turkish police have arrested 44 people suspected of having links to an exiled Islamic cleric accused of seeking to overthrow the government. Top bureaucrats and police officers were among those held in a crackdown on supporters of Fethullah Gulen, the state-run Anadolu agency said. 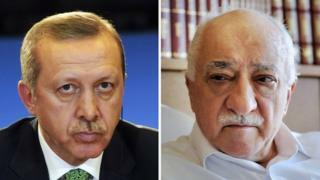 Mr Gulen is a rival of President Recep Tayyip Erdogan, whose AK party regained its majority in Sunday's election. European observers said violence and media restrictions marred the polls. On Tuesday, left-wing magazine Nokta said two of its editors had been charged with plotting a coup in the government's latest move against opposition media outlets. Cevheri Guven and Murat Capan were arrested over a magazine cover criticising the election results that read: "The start of civil war in Turkey." An Istanbul court later ordered that the magazine's latest edition be withdrawn from the shelves, accusing it of inciting the public to commit a crime. Meanwhile security forces imposed a curfew in the mainly Kurdish town of Silvan, the south-east of the country, while Turkish jets attacked Kurdistan Workers' Party (PKK) rebels in northern Iraq. The Anadolu agency said that the dozens of suspects held in Tuesday's raids were suspected of acting "beyond their legal authority". Prosecutors issued arrest warrants for a total of 57 people. The Turkish government has accused Mr Gulen, the spiritual leader of the Hizmet movement, of trying to run a parallel state. The latest police operations come after officers raided another media group, Koza-Ipek, accused of having links to Mr Gulen. Fifty-eight employees working at the group's media outlets have been fired after a court ruling placed it under the management of a trustee panel, according to Hurriyet newspaper. The AKP's victory on Sunday came amid concerns about rising tensions in the country. Violence has escalated in Turkey since a suicide bombing in July by suspected IS militants which killed more than 30 Kurds. A double bombing targeting a Kurdish peace rally in Ankara also killed more than 100 people last month. On Monday the Turkish military said it had carried out air strikes on PKK militant bases across the border in northern Iraq - the first on PKK targets in Iraq since Sunday's election. In a statement on Tuesday the military said that Turkish jets hit PKK shelters, bunkers and weapon storages in six locations, including the Qandil mountains where the rebel leaders are based. The military has been targeting bases and hideouts of the PKK since July, when renewed fighting between the rebels and Turkish security forces broke out, signalling a breakdown in a two-year ceasefire.